Ferry Island Fort is located in St. Georges, a little offshore from the Ferry Point and on an island called the Ferry Island. Right from the early settlement days in 17th century until the Causeway connecting the main island with St. George's was constructed, the ferry between the Coney Island and Ferry Island was considered extremely important. The ferry was the only transport connection between St. George and the main island during that time. 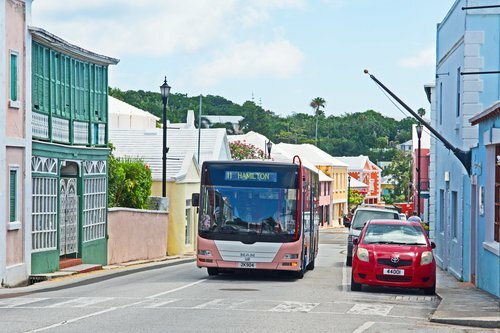 During the early British settlement, it was planned by the British Army that in case Bermuda's main land was attacked by the enemy, the people could retreat to St. George by using this ferry line. With such plans in mind, in 1790s Captain Andrew Durnford first built a battery on top of the Ferry Island to protect this important area. In early 1800s, three 18-pound guns were mounted on the fort. Subsequently in 1870s, the Ferry Island Fort was reconstructed with provision of four large cannons. You can walk across to ferry Island over a small footbridge from Ferry Reach Park. Walk around while looking at the ruins and the scenery, it will take you back to the 18th century feelings of how this fort was once used to defend a lifeline of Bermuda. Located at St. George Bermuda. Bus routes #1, 3, 10, 11 (operating between Hamilton City and St George). You will need to get off at Mullet Bay Road and Ferry Road junction. The Ferry Reach Park is at the end of Ferry Road (takes about 30 minutes walk from the junction) and the fort is at the western tip of the park. From Hamilton City, the bus takes about 40 minutes to reach the junction where you get off while from St. George it takes about 15 minutes. 1) Check out Bermuda Forts to know about the historic forts in Bermuda. 3) Check out St. George's to find out other great attractions in the parish.